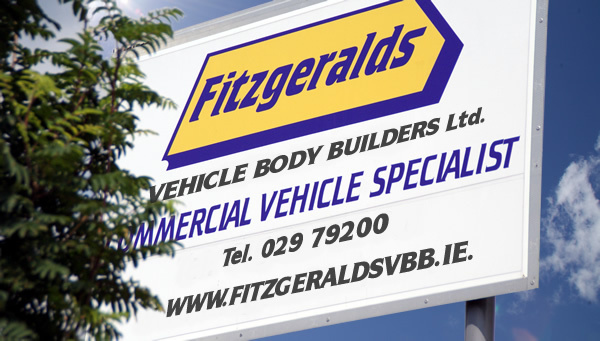 Fitzgerald vehicle body builders have been in the industry for 37 years and are always at the forefront of Design & Innovation, always looking to bring new, practical ideas to the market. Working from our Purpose built 70,000 sq ft factory on a 3.5 acre site, we have the capacity to manufacture everything from a single unit to high volume production of multiple units. We work closely with our customers to deliver the workable solutions needed to produce the results they require. You will find us easy to talk to and informative in our approach. We always aim to keep you fully informed every step of the way! Please feel free to contact us by phone, fax or email to discuss your ideas, plans and requirements or just an informal chat about our product range and what we can deliver. We are an NSAI approved vehicle body builder; please view our certifications by selecting the links below.